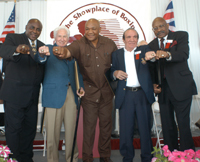 WITH thousands of boxing fans assembled in the brand new Courtyard of Champions Events Amphitheater at the International Boxing Hall of Fame Museum, the Class of 2003 joined boxing immortals when they were enshrined into the Hall of Fame during the Official Induction Ceremony on Sunday, June 8th. The Induction Ceremony capped a fun-filled 4-day Hall of Fame Weekend. The Hall of Fame Weekend featured over 20 exciting events including a golf tournament, cocktail party, banquet, boxing autograph card show, professional boxing show, and a host of activities on the Museum Grounds, including the very popular "ringside lecture" question and answer sessions. This year's living inductees were 2-time heavyweight champion George Foreman, welterweight king Curtis Cokes, 3-division champion Mike McCallum, junior welterweight champion Nicolino Locche, Academy Award-winning screenwriter Budd Schulberg and journalist Jack Fiske. Living honorees received the official Hall of Fame Induction certificate and gold Hall of Fame ring symbolizing their status as Hall of Famers. Fiske, who covered boxing for the San Francisco Chronicle, was unable to attend due to poor health. With Hall of Famer Jose Torres interpreting, Locche said, "I am very grateful to be here. I am very honored to receive this prize from the International Boxing Hall of Fame and I will forever remember this day." Schulberg, who penned The Harder They Fall and On The Waterfront commented, "As I lay in bed last night, I said, 'I'm not dreaming, am I?' It's too much…Starting out as a 10 or 11 year old, I was dreaming of something like this and I'm a little bit afraid that I'm still dreaming. I just hope I don't wake up and find out it was all a dream…All I can say is I'm going to keep on Canastota dreaming." Upon receiving his Hall of Fame ring, Cokes said, "I really am happy to be here...I had a long career and it was pretty successful. I enjoyed every moment of it. Boxing is a real fun sport to be involved in. The boxers and world champions are some of the greatest people I ever met in my whole life...I want to thank everybody so much for coming here and seeing me inducted into the International Boxing Hall of Fame." Jamaica's first world champion Mike McCallum accepted his ring and said, "This is an extreme pleasure. I'm overwhelmed. I've won the title three times, it's beautiful, a great achievement, but today this is breath taking… This is our sport. We love it. It's rough. Sometimes you cry, sometimes laugh and sometimes you're happy. I want to thank my people in Jamaica. I'm the first champion from Jamaica. I hope this will help Jamaican kids to look up to do something positive with their lives." Foreman entertained the crowd with a comical look at his fight career. " I'm a Boxing Hall of Famer, and I love it …I left boxing in 1977 and said I would never do it again and I intended never to box again…I got back into boxing and it was rough going. People were making jokes, 'How is George Foreman ever going to be the prodigal son of boxing if he still looks like the fatted calf? He can't be heavyweight champ of the world as long as his training camp is Baskin Robbins.' I heard it all, but I knew how to box…"
Posthumous inductees of the Class of 2003 were honored. Fred Apostoli from the modern era, Battling Battalino, Louis (Kid) Kaplan, Tom Sharkey and Jess Willard in the old-timer category, Caleb Baldwin and Joe Goss in the pioneer category, Dewey Fragetta, Dan Duva and Al Weill as non-participants. Family members for Battalino, Kaplan, Sharkey, Fragetta and Weill were on hand to accept Hall of Fame honors for their relative. Hall of Famer Lou Duva delivered a touching acceptance speech for his son Dan Duva, who was inducted posthumously. "Sometimes, somewhere, somehow, someone will rise and make us all proud. How proud I am of my son Danny," said Duva. 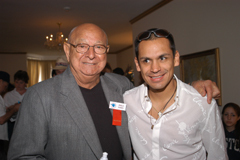 Among the boxing stars on hand for the weekend were Hall of Fame Alumni: Carmen Basilio, Carlos Ortiz, Aaron Pryor, Jose Torres, Emile Griffith, Ruben Olivares, Gene Fullmer, Ken Norton, Ken Buchanan, Duva, Pipino Cuevas, Mickey Duff, Matthew Saad Muhammad, Marvelous Marvin Hagler, Angelo Dundee, Gil Clancy, Don Chargin, Arthur Mercante, Bob Arum and Ralph Citro. Past or present world champions in attendance included Billy Backus, Christy Martin, Tony DeMarco, Jimmy Ellis, Terry Norris, Leon Spinks, Frank Bruno, Marlon Starling, Iran Barkley, Livingstone Bramble, Donald Curry, Juan LaPorte, Ricardo "Finito" Lopez, John H. Stracey, Mando Ramos and reigning IBF heavyweight Champion Chris Byrd. 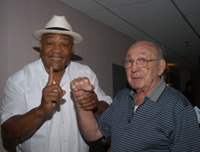 Other notable fighters and boxing personalities in Canastota for the weekend were Earnie Shavers, George Chuvalo, Howard Davis, Jr., Angel Manfredy, Gasper Ortega, Bert Sugar, referee Joe Cortez and Canastota's Dickie DiVeronica. This year's Grand Marshal of the Hall of Fame Parade of Champions was Syracuse University Basketball head coach Jim Boeheim. Boeheim guided the Orangemen to the 2003 NCAA National Championship in April. The Hall of Fame Weekend got off to a special start on Thursday, June 5th when Aaron (The Hawk) Pryor married Frankie Lynn Wagner at the Courtyard of Champions Events Amphitheater. In front of hundreds of fans and over 30 boxing legends of yesterday and today, Canastota Mayor Todd Rouse performed the ceremony as Aaron and Frankie exchanged vows to become husband and wife. The Friday Night Boxing Show at Turning Stone Casino Resort featured a full card of professional boxing with fan-favorite Angel (Got Jesus) Manfredy scoring an impressive 7th round TKO over tough John Bailey in the main go. Living inductees from the Class of '03, Mike McCallum, Budd Schulberg, George Foreman, Nicolino Locche and Curtis Cokes on Induction Sunday.